By the Jaeger Watch Co. Inc. U.S.A. Stores reference 6A/2197. American designed clock with an 8-day keyless seven jewel lever movement. 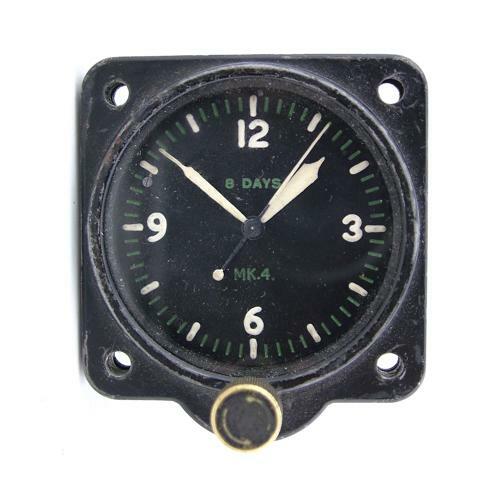 Metal case approximately 6 x 5cm with 5cm black dial having luminous Arabic numerals, hands and sweep second hand. Single winding and setting knob at the 6 o'clock position. The dial is in excellent condition and marked '8 DAYS' & 'MK.4'. The case is also very good but does have a few paint chips. Manufacturer's plate riveted to the rear with Air Ministry marks, order, part and specification numbers. With 1942 date code. Looks good and appears to keep good time but the hour hand needs minor adjustment as it is slightly out of line - quite a simple job. Stock code C23112.